Bee's Circus: 282. 38 week pregnancy update! I've been a little absent here this week, I guess I just feel like I haven't had much to share, that and my addiction to SuDoku & Made In Chelsea is getting out of hand! 38 weeks (+3) and still going strong! I finished at work today which was emotional and overwhelming, we got an ncredible amount of super sweet gifts & really I'm sad to go! But, on the other hand, definitely looking forward to a 'rest', or just not standing up all day! I'm really proud of myself for working so long, some may think I'm mad and obviously if I had had the baby already if would be a different story, but I'm just looking forward to all the time I'll get to spend with my two boys (as I'm taking a year off). My Mum's pretty adamant he's going to come next week, she has the next two weeks off so it would be lovely, she's going to be marching me around on long walks and feeding me up with pineapple and curry I guess! I think we're going to take Daniel out next week, I'd love to take him to the zoo r something but we can't go too far. Baby is the size of a pumpkin - About 18.9-20.9 inches long and weighs about 6.2-9.2 pounds! I will be pretty upset if he's that big though, we have been gifted tons f adorable newborn size clothes & I'll be gutted if he's too big for them! You can't really tell if he's going to be big or not by the size of my belly, though he does seem to be right up in my ribs and right down in my pelvis so I think he's pretty long! Not very comfortable for Mama, the only way I feel mildly happy is lying down, but even that makes me sore after a while! I'm pretty glad I've finished work now (and the temperature has dropped) so I can live in my maternity jeans! 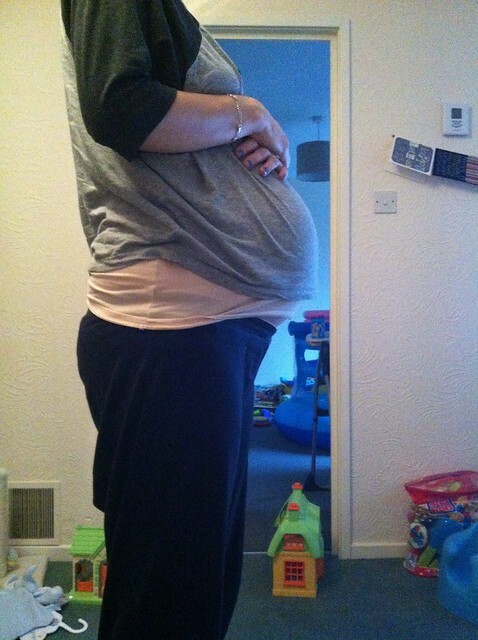 The two pairs of maternity trousers I bought were getting incredibly snug! Who makes maternity trousers with buttons on the inside?!? Jeans and yoga pants from here on out ladies!! I'm considering beng very optimistic and buying a couple of pairs of trousers in a size up to wear once I have him, it only took me a few weeks to get back into my regular jeans after I had Daniel, and I hate leggings with sandals!! I could always send them back I suppose! Sleep is hit and miss, I think last night I slept pretty well, luckily it was cooler too, but today I still feel shattered! Just getting me ready though I guess! My main problem is feeling sick, I think from where my belly isn't wupported very well by my duvet. Note to self - buy another feeding/v-shaped pillow ASAP! I had a bit of a funny turn this morning at work, I came over all hot and nauseas :( I think it was a combination of the warmth and being hungry, must remember to eat regularly now I'm off work! I think I'm going to try and keep us as busy as possible, even though it's the Jubilee weekend & half term, to make the most of the time I have just us, and to make time go a little faster too! I'm going to avoid driving much though, just in case!! Also on the itinerary, updating my iPod and iPad (woohoo!) and deep cleaning the whole house! Starting tomorrow with a serious tidy up - my baby shower is here in Sunday and my house is a disgrace! Also, putting the finishing touches to the nursery and two ton of washing and ironing!